I make a lot of bread. I believe that in the last 2 years I’ve gone through 3 25 lb bags and 1 50 lb bag of flour. It’s time to start taking better notes. Here we go! I just added the “Bread” Category to this blog. I have retroactively put all my bready posts into this category. I just finished a 25 pound bag of First Street Bread Flour from Smart and Final. It was about $12. Standard loaves come out a bit softer and sweeter than with the previous Hotel all-purpose flour (I forget the exact name, it’s from Smart and Final and has the word “hotel” in it). I like it. I just made some focaccia with it and it was very easy to flatten out. The Hotel flour has a strong tendency to spring back. 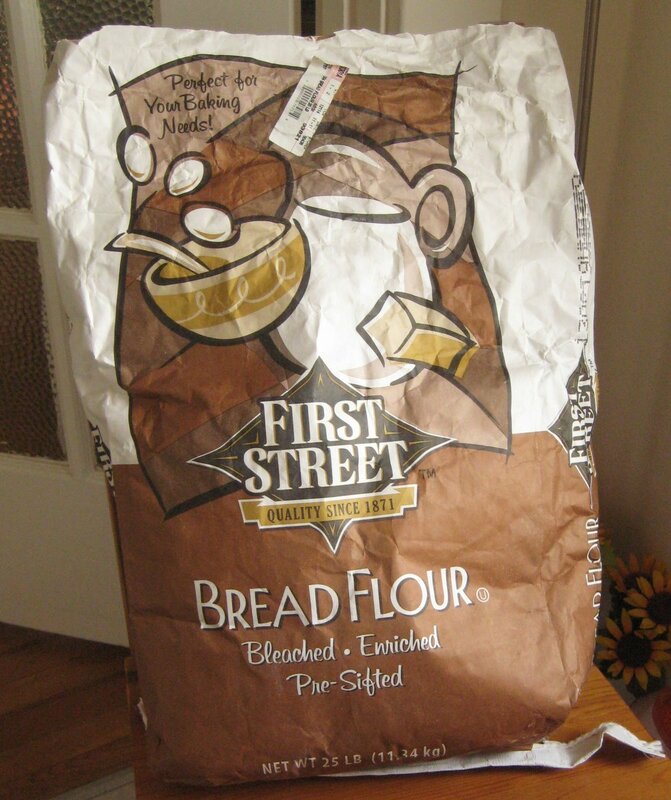 A 25-lb bag of First Street Bread Flour was on sale today for $7.59 – a very good deal considering a 5-lb bag of bread flour is about $5 at supermarkets. I think the Hotel all-purpose flour is Gold Medal (in a brown bag) – it was also on sale for $7+. And yup, the “Hotel” flour is Gold Medal Hotel and Restaurant flour. 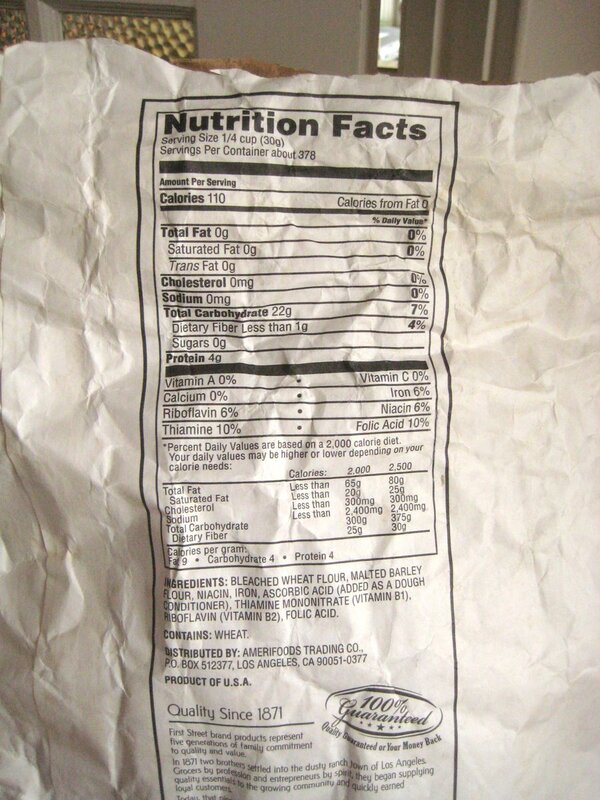 Just picked up a 25# bag of First Street bread flour for $7.29 here in El Cajon CA. Nothing but the best from Smart and Final! I recently purchased First Street Bread. There is no mention on the package as to where it is made, nor any contact information. After purchasing the bread, I looked at the ingreedients and found that there is high fructose and soy flour, and other soy ingredients, which is a genetically modified food and extremely bad for the human body as is high fructose and I am appalled that you are using such bad ingredients for this bread. I will no longer buy First Street products nor will my family and friends, until you start using better ingredients. Lydia, do you know where you left your comment? I am not First Street Bread. Lee I think Lydia was informing you and all reading your blog of the poison inside the bread flour of your choice. That most just don’t know about. But why the cocky response? She sounds very intelligent and I am sure is aware of where she is posting. People just don’t know what they don’t know, and Im sure she was trying to be informative. I know I sure am grateful someone shared it with me. These ingredients are directly related to 90% of disease today, particularly diabetes which effects every family in one way or the other. My 11 and 12 yr old were being pricked for cholesterol for three years in a row and were borderline diabetic and told they would have to go on medication. After going organic and removing gmo’s or anything processed. An changing our lifestyle in 30 days their bloodwork came back COMPLETELY NORMAL! Pretty life changing and definitely worth sharing. Your on a blog that reaches ppl all over the place. If you can recommend a bleached and enriched bag of flour that is filled with harmful chemicals, to many who are unaware of the huge epidemic in our food supply (like i was), at least they have the right to know what it is. At least now the have the knowledge to make their own choice. And just like you asked Lydia, who was just being informative, if she knew where she left her comment? (So rude and unnecessary ) maybe you need to be reminded that you put yourself on a public platform, on the Internet where ppl anywhere around the world who have Internet service can see and comment. And the clincher is, IT’S A BLOG AT THAT. You pushed that door wide open. Prime example of you are what you eat! And if your eating crap, apparently you spew it. The last bag I bought of this flour yielded a lot of failed loafs. It feels like the flour is practically gluten free. I had to add 10% gluten to get it to behave well.